Looking to hang onto your hard-earned cash a little longer? 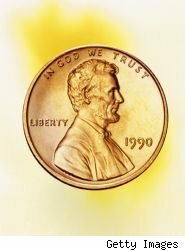 Instead of pinching pennies, research suggests converting them into big bills. Researchers from New York University found we tend to hang onto $50s, $20s and even $10s longer than we do $1s and $5s. The theory: It's more painful to part with a big bill than it is a little one. "People tend to over-value large bills relative to an equivalent sum of money in smaller denominations because of self-control reasons," says one of the study's authors, Joydeep Srivastava, professor of marketing at University of Maryland. That "overvaluing" leads us to make more impulse purchase with small bills or "change" than if we the same amount of money (or even a few dollars less) in larger bills. Interestingly, the large bill effect wears off once the bill is broken. "Once the large bill is spent, people actually spend more than they would have if they had made the purchase with smaller denominations," says Srivastava. Dig through your sofa cushions, coat pockets and crevices in your car for all that neglected loose change. Cash in those coins -- and smaller bills, too -- for larger denominations. You'll be more likely to treasure a $20 bill than a handful of change, a $5 and a couple of $1s. Forget stuffing money into your pocket, or even stashing it in secret purse compartments to keep from spending it. The researchers say all you have to do is keep the larger bills on top of smaller ones in your purse or wallet. That way, when you retrieve your cash to pay for a purchase, you'll see the larger bill on top and give thought to spending it.